Runnin’ with a dev, oh! We were runnin’ with a dev, oh! 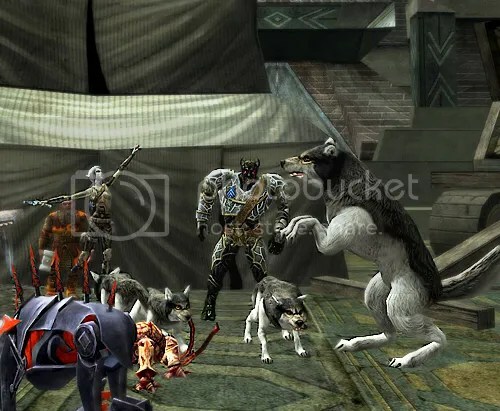 Yep, that’s right, I’m one of the lucky folks who got to run with Turbine Senior Community Specialist Tolero during her 24-hour marathon DDO session. I’m not sure how long she’d been on Thelanis when Shin (who we’ve dragged over to T-land from Cannith) sent me a tell to let me know Tolero, who was playing a user-voted 3 sorc/3 druid/1 bard named Permagimpa Youvebeenwarned, had one more opening in her Caverns of Korromar group. To my surprise, I actually managed to log out Chalei and log in Winnie fast enough to grab the spot, and off we went! It was a fun, chatty group. No one seemed to mind when I warned them that Winnie wasn’t (yet) built to be much of a healer (she’s designed for endgame content), although I did throw out some heals here and there (and promptly sang, virtual-style, to Shin: “I healed a dev and I liked it“). But it got better from there, even though our other cleric suddenly recalled and dropped group with no explanation. I alerted Slvr right away, and he hopped in on his druid. We did have a few more deaths, including one of Tolero’s (but hey, I carried her soul stone to a shrine!) and one or two more of Winnie’s. After the completion, we got our end rewards and had an impromptu dance party there in House K while we pondered what to do next. Watching Slvr dancing in wolf form got us to talking about various animations, and Tolero told us that the wolf swimming animation came from, IIRC (hey, it was late and my memory’s not the best anyway), one of the devs filming another dev’s dog swimming. I was kinda nervous about the arti because he’s in a permadeath guild, so I was thinking, “Noooo! Don’t let me let him die! I don’t want to be the reason he has to delete and start over!” So I was VERY glad that, although there were a couple of deaths, none were his. Tolero had to drop partway through, as Thelanis had already monopolized her for more than the three hours allotted in her marathon schedule (I was sorely tempted to drop as well and log onto my lvl 7 Sarlona monk :D). But we pressed on and got the completion, including a trip to see the Avatar (no Muck’s Doom for anyone, darn it). All in all it was a great night. Tolero is a lot fun and very easy to talk to. While I wonder if some of the devs have ever actually played the game, it was clear that she’s a DDO veteran; in fact, she was talking about her first toons and mentioned that this was BEFORE she started working for Turbine. And anyone who can take a 3/3/1 sorc/druid/bard with minimal gear (just the Vet Status 2 stuff and things she looted or was handed; I was really glad I had a pair of min lvl 5 unbound FF boots in my bank for the Pit!) and run Korromar and Pit on elite – and do it well – clearly knows how to play the game. But for all the fun, the real purpose of Tolero’s DDO marathon was for a good cause – to raise money for the the Children’s Miracle Network, and specifically for Children’s Medical Center of Dayton. Via her blog and her Twitter, Tolero promised various rewards to DDOers as her donation goals were met. As of this writing, she’s shattered her original goal of $2,500 in donations – she’s at $6,063 and hopefully still climbing! To learn more about Tolero’s fundraising efforts, why it’s personal for her, and the goals she set (along with the rewards to DDOers as each was achieved), please check out her participant page on the Extra Life site. Tolero, if you happen to read this (heck, even if you don’t), thank you! for a great fun night and for all your good work!